Book one of our developers for one hour of Magento development. 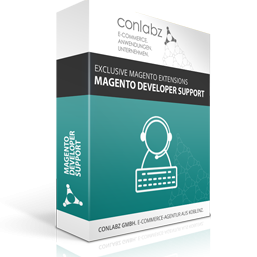 Do you need support adapting and/or setting up extensions or expanding your Magento Shop? Our developers will gladly help you with customised work. This "product" includes one hour of development: Let us know about the scope of your wishes and concerns and we will tell you about the amount of hours to book. In case you want to contact us, use our support widget in the bottom right corner or directly write a mail to our support@conlabz.de.